Bloomberg reported today that Uber is looking to raise over $2 billion in a new funding round, which would value the company at well over $60 billion. The report states that Uber’s new funding may help the company expand beyond car-booking, and allow it to provide additional services such as food and package delivery. As part of our continued analysis of Uber’s patenting activity, Envision IP reviewed Uber’s current US patent portfolio in light of today’s financing news. This past May we reported that Uber had received its first notice of allowance by the USPTO. The company has significantly increased its US patent portfolio in recent months, in part from acquisitions, as well as organic patenting efforts. While some of the Microsoft patents are directly related to Uber’s business model (i.e, for mapping, object movement detection, and data collection), interestingly, many of the patents relate to image analysis technologies. For example, some of these patents relate to spatially identifying aspects and views of objects within an image. Uber could possibly utilize these advanced imaging technologies for proprietary map creation, as well as autonomous driving technologies. Three of the deCarta patents relate to organizing objects in a map database and have a priority date going back to 1997. Other deCarta patents that relate to location-based billing and querying moving point data have priority dates from 2000. 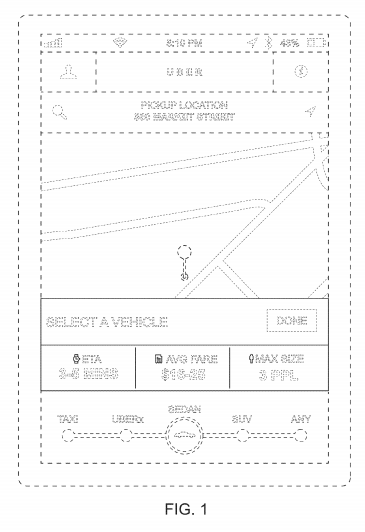 These patents may prove very useful to Uber, as it gives the company relatively fundamental patents on technologies used by the on-demand ride industry. Uber currently has 34 published, pending US patent applications, with one acquired from Microsoft, and 6 acquired from deCarta. 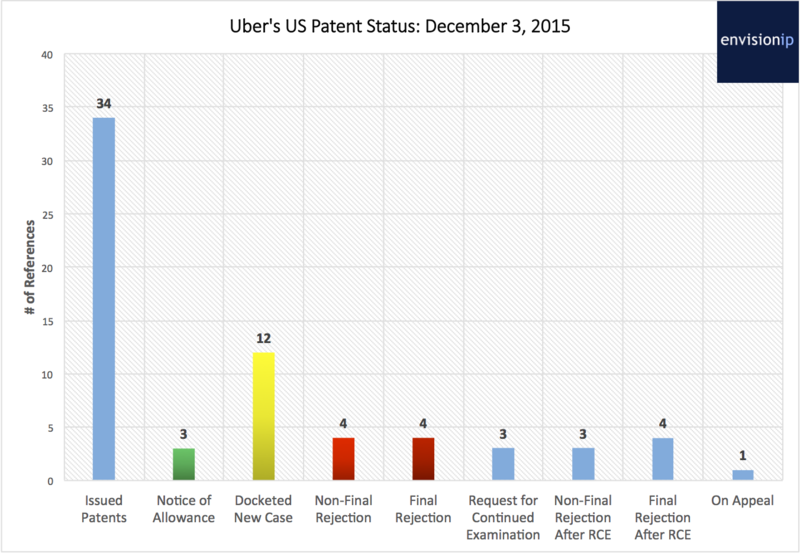 The remaining 27 patent applications were originally filed by Uber. 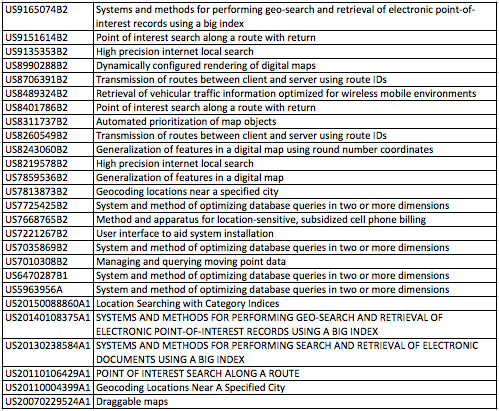 This is a significant increase from the 16 published applications filed by Uber that we reported last May. These applications relate to driver dispatch and selection technologies, fee splitting between passengers, providing promotions to riders, and dynamic fare updates, push notifications, and receipt generation. The company continues to battle with the USPTO in an effort to obtain new allowances, and Uber has not currently abandoned any of its patent applications that have been rejected by the patent office. 11 applications are currently in a request for continued examination (RCE), and one application is on appeal. With the acquisitions of the Microsoft and deCarta patents, Uber has demonstrated the importance it places on patent protection. With its additional funding, the company may continue to bolster its patent portfolio with further strategic acquisitions. It is clear that Uber is attempting to innovate itself however, and it is not just relying on acquiring existing patents. However, as Uber’s patent prosecution statistics reveal, obtaining new patents in the on-demand ride space may prove a challenge.